The rugged hills enclosing Lake Mohave, while quite scenic and impressive from afar, lack many specific points of interest so are not a major hiking destination, especially as conditions for much of the year are very hot, with temperatures exceeding 100°F for 4 or 5 months in summer. But there is one good trail a few miles south of Hoover Dam, leading to the Arizona Hot Springs, a 110°F water source in an unusually colorful slot canyon, which contains hot pools, cascades and a 20 foot waterfall. 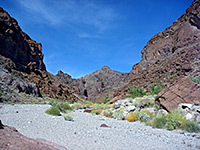 The 3 mile hike to this secluded location encounters four different landscapes - it starts along a wide desert wash beside US 93 then descends a narrow and enclosed ravine (White Rock Canyon) through dark, rather foreboding volcanic rocks, eventually emerging beside the deep, greenish waters of Lake Mohave, opposite Ringbolt Rapids on the Colorado River. 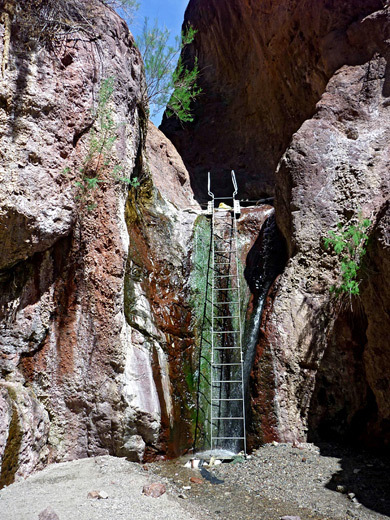 After traversing south along the shoreline a way, the final part of the trail enters the cool, moist confines of the slot canyon, reaching the springs via a metal ladder next to the waterfall. Overall this is an excellent hike, not too difficult, and deservedly quite popular during the cooler months of fall, winter and early spring. Map of Lake Mead National Recreation Area. 20 views of Arizona Hot Springs and Lake Mohave; gallery, slideshow. 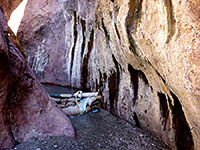 The hike to Arizona Hot Springs begins 3.5 miles south of the Nevada stateline along US 93, at a large parking area on the east side, recently resurfaced and upgraded as part of the Hoover Dam Bypass project. The trailhead overlooks the highway bridge over the upper end of White Rock Canyon, at this point a wide, stony dry wash; just to the east is an older, disused bridge, part of the original course of US 93 prior to realignment and straightening in the 1960s. The path descends into the wash, passes under US 93 and follows the wide, bushy streambed westwards. A notice just after the road bridge gives distances for the hike and advises against travel between June and September owing to the extreme heat and lack of water. After half a mile the wash starts to narrow, drops down over a few small dryfalls and is soon bordered by low cliffs, the floor now bare rock in places. The walls rise higher as the ravine becomes quite enclosed, in shade at some times of day and hence a little cooler. The rocks are dull grey/brown/black in color, volcanic in origin and not particularly attractive, though they provide a nice contrast with the bleached white pebbles in the streamway, and occasional green plants at the side. The canyon twists and turns, remaining similar for nearly a mile before opening out to a wider, straighter section, followed by a few more curvy narrow passages, and finally a more open and overgrown area as the Colorado River approaches. The surface underfoot is loose gravel most of the way so the hike is rather tiring, especially when returning, even though the gradient is never very steep. Seasonal seeps in the lower end of the gorge provide drinkable water, but for most of the year the wash is completely dry, yet is home to a good selection of cacti, wildflowers and bushes, plus mesquite trees near the lake, as well as many lizards including the large, secretive chuckwalla. 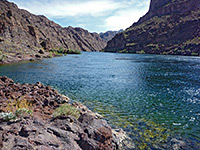 The greenish-blue water in Lake Mohave is always clear, cold, deep and fast flowing, swirling past the rugged igneous rocks on either side (see 360 degree panorama). Although most of the shoreline is formed of sheer or steeply-sloping cliffs, some places have shallow, sandy bays suitable for paddling if not swimming, and the path passes a couple as it turns south at the end of White Rock Canyon, also climbing over an elevated promontory that gives good views up and down the Colorado River. A few signs mark the route though the course is not always obvious. This part of the lake is often quite busy, with rafts and boats from the marina at Willow Beach to the south. After rounding a tamarisk-lined inlet, the trail climbs a gravely slope to a ridgetop then drops down the far side into the canyon below the hot springs - this is narrow, and contains a small stream, flowing over a bed of coarse, clean sand, though the waters soon sink below ground. Downstream, the ravine is dry, edged by mesquite trees, and quickly widens into a bushy area beside the Colorado, a popular place for primitive camping. Upstream, the canyon bends a few times, gaining height via several little cascades, becomes sheer-walled and reaches an enclosed chamber and the 20 foot waterfall, climbed via an 18-rung metal ladder. Past here are four pools of increasing depth and heat, kept in place by sandbags and separated by short slot passageways, ending with a climb of a few feet past the uppermost water source into a dry part of the ravine, which soon opens out into a typical desert wash. The rock walls in the narrows are strange and photogenic - grey/pink/purple in color, tinged with dark vertical streaks, irregular in texture and partly covered by white salt encrustations, and with added contrast from the glistening stones in the streambed and the trickling, reflective waters. The sandbags spoil the naturalness of the scene somewhat but this is still a very special place. As with most hot springs, the water harbors harmful bacteria, so hikers should take care not avoid contact with the nose or mouth. An alternative way back to the trailhead is to follow the canyon above the hot springs, through some moderately interesting narrows, for about 1.5 miles, then walk cross country in a northwesterly direction for another 0.7 miles, intersecting the earlier trail near the US 93 bridge.